Playing the best courses in the world is definitely the dream of any golf fanatic. 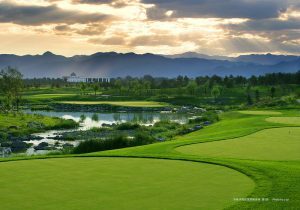 We count down from number 10 to the top ranking golf course in the world. Muirfield has hosted the Open Championship 16 times and celebrates a rich history of golfing excellence. The signature “clockwise front-nine, counter-clockwise back-nine” was a unique routine scheme introduced during H.S. Colt’s redesign in 1925. The oldest and longest continually existing golf club in Australia, the Royal Melbourne is an Alister Mackenzie gem and the course’s bunkering is an example of the height of the art form. Players are tested with a variety of unique approach shots and magnificent greens. Church pews and the undulating greens – which are arguably some of the most difficult in the world – are just a few of the unique selling points of Oakmont Country Club, which hosted the 2016 U.S. Open. An early Old Tom Morris masterpiece, Royal Dornoch is one of the most celebrated link courses in Scotland. Unfortunately its relative inaccessibility has seen it passed over for the hosting of major tournaments. Royal County Down has hosted several significant competitions such as the Irish Open 3 times. The surroundings are so staggering that you will want to spend time there even if you’re enjoying the online betting NZ has to offer instead of golfing! Shinnecock Hills has hosted 4 U.S. Opens and is hosting again in 2018. Players will find many courses in this style in the New Jersey/New York area, but Shinnecock is the best of its breed. All Alister Mackenzie had to do to create this absolutely breath-taking course was plot the best route through the spectacular natural surroundings, and Cypress Point transcends natural beauty to become something almost otherworldly. Augusta National is the only course on this list which is a permanent fixture of the Masters Tournament every year in April, and the course looks completely different to the original as it has been constantly reworked by famous architects such as Perry Maxwell. Course founder George Crump utilised some of the finest architectural minds in order to create the unique ‘island to island’ layout of the Pine Valley course, and is said to blend all 3 schools of golf design – penal, heroic, and strategic – often all on a single hole. The Old Course has hosted the Open Championship a staggering 29 times and people have been playing golf on this particular piece of land since the 15th century. No single hand has alone crafted this masterpiece, and massive rolling greens, cavernous bunkers, blind shots, and the peculiar Road Hole treat players to an unforgettable experience.